Clip preview of the old film. It's one of the best scenes in it. I *didn't* upload this preview. It's an official preview from Youtube Movies. 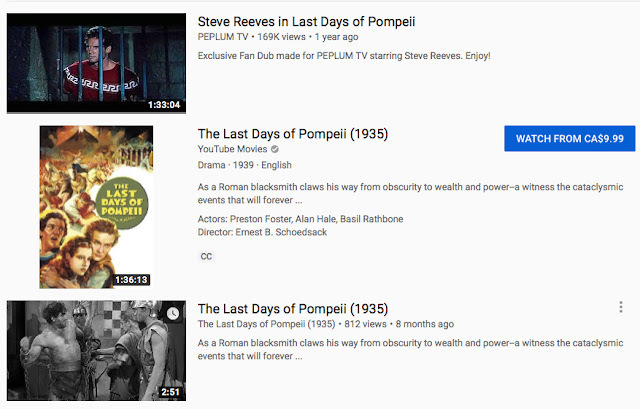 I searched 'Last Days of Pompeii 1935' on Youtube and below is what pulled up. You can view the 1935 film for $9.99 from Youtube Movies! The first result was my upload of the 1959 version at PEPLUM TV. Youtube is basically trying to muscle me out of the site since I still pull more views than they are. I really like the 1935 version, but I am generally a big fan of the movies of the 1930's. They have some kind of movie magic that seemed to fall into a meeker standard in later decades. Props and various cinema trickery were provided by the effects team behind "King Kong."